The twentieth century was characterized by massive technological changes that impacted the course of human history in ways that would make the world of 2000 nearly unrecognizable to individuals living a century before. Most people living today view consistent advances in standard of living to be the norm. However, the steady advance of living standards is really a story of the past two centuries. The family of 1800 shared much in common with the way of life of their ancestors in 1700 and 1600. But by the early 20th century, per capita GDP had more than quadrupled from levels seen in the early 19th century. Cynics of the early 1900s who thought that living standards had finally plateaued were quite mistaken. Progress dramatically accelerated. From 1913 to 2008, per-capita GDP increased nearly six-fold. As Steve Jobs famously observed, people often do not know what they want until you show it to them. When brand new products are introduced, consumers do not automatically line up to make purchases because the underlying need has yet to be established. Whether the novel product is a disposable handkerchief in the 1920s, a refrigerator in the 1930s, or the iPhone in 2007, consumers need a compelling reason to part with substantial amounts of their hard earned cash. They need a “reason why” the product should be purchased. What does the product do for them that they previously had not conceived of? How will it become an indispensable part of their lives? Advertising, whether in print, over the airwaves, or on the internet, must provide a coherent storyline that consumers can embrace. Few people in the 1950s would question the need for a refrigerator just as few today would question the need for a smartphone. Advertising was the spark that created the initial demand. 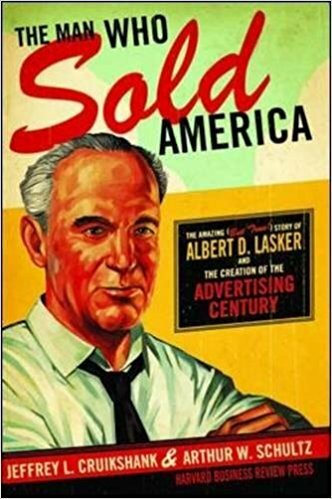 The story of Albert D. Lasker, as told in The Man Who Sold America, is synonymous with the story of how advertising transformed the American economy during the first half of the 20th century. Constant technological progress was a given for Lasker who was born in 1880 and grew up in booming Galveston at a time when the city was the center of trade in Texas and rivaled New Orleans as one of the nation’s largest ports. Lasker showed streaks of entrepreneurialism as a child. However, his passion was not in advertising but in journalism and by the age of sixteen, he was already scoring scoops and writing for the local newspaper. Although Lasker said that “every urge in me was to be a reporter”, his father did not approve of the “drunkenness and debauchery” then common among reporters. Lasker’s father called in a favor with Daniel Lord, one of the principals of Lord & Thomas, and Lasker soon moved to Chicago to embark on his career in advertising at the young age of 18. Being forced into a career choice by one’s parents typically does not turn out well but Lasker’s case was an exception. He found that he not only was exceptionally good at sales but enjoyed the work and rapidly advanced within the firm. This was fortuitous because shortly after Lasker married in 1902, his wife contracted typhoid fever and became permanently disabled. Facing very large medical bills, Lasker gave up any remaining dreams of switching to journalism: “From then on, I had to concentrate on work, and from then on, I knew I was fooling myself that I would ever get out of advertising.” By early 1904, Lasker was considering striking out on his own after achieving notable success marketing products such as Van Camp’s canned pork and beans. At the insistence of Frank Van Camp, Lasker was made a one-quarter partner in Lord & Thomas on February 1, 1904 at the age of 23. Following the death of Ambrose Thomas in 1906, Lasker became the leader and half owner of Lord & Thomas and by 1912 he had achieved full control of the firm which he would control for the next three decades. Readers with an interest in advertising and marketing will find the story of Lasker’s leadership of Lord & Thomas to be particularly fascinating. Lasker went on to pioneer many advertising techniques including “reason why” advertising and figuring out ways to measure the effectiveness of individual advertisements. Advertising had been largely unscientific and it was difficult to measure the impact of spending by clients. There’s an old joke that half of advertising spending is wasted but the problem is that no one knows which half. Lasker used mail order advertisements to test and validate various approaches. He would run variations of print advertisements and test the response rate of different variations, and then concentrate resources on those techniques that had proven effective. This might sound familiar to those who have employed “A/B testing” in contexts such as web sites. Lasker’s notable achievements include inventing the Sunkist and Sun-Maid brands, broaching the sensitive topic of how to market sanitary napkins with the Kotex brand, dramatically improving the performance of products such as Palmolive soap and Pepsodent toothpaste, and perhaps more controversially, expanding the appeal of Lucky Strike cigarettes to women. Lasker, who died in 1952, is the man most responsible for transforming the advertising industry and ushering in a century of ever increasing demand for consumer products. Albert Lasker did not live to see the dawning of the Information Age and the amazing consumer products that have surfaced over the past several decades. What can we learn from his life and legacy that might be relevant to today’s world? It might be tempting to say that the world is so different today that few of Lasker’s insights and contributions are relevant, but this would be a hasty conclusion. “Reason why” advertising is just as relevant today as it was a century ago. Perhaps the most salient example involves a product that no one viewed as essential a decade ago: the smart phone. Sure, cell phones were common during the 1990s and were viewed as important tools, but today smart phones might as well be permanent appendages for a majority of people in wealthy countries. The iPhone, much ridiculed by certain competitors, featured a virtual keyboard and was, quite simply, a fully featured computer that fit in one’s pocket. Lacking the rigid physical alphanumeric keyboard featured on competing products, the iPhone could transform itself from a mere telephone to a web browser and innumerable other applications, none of which were considered “essential” by consumers prior to the product’s introduction in 2007. But the product was initially met with much skepticism. It took a marketing genius to convince the public that the product had mass appeal. Steve Jobs may or may not have been inspired by Albert Lasker but he understood “reason why” advertising. He did not respond to the current demands of consumers. He created new demand for an entirely new product by explaining the benefits of the product and showing how it would be an indispensable part of our lives. Mass media is still the driving force behind most advertising, although highly personalized advertising is now possible online and is being fully exploited by companies such as Facebook and Google. Mass market advertising in print, television and radio still bears much resemblance to advertising from many decades ago and adheres to the same underlying principles pioneered by Albert Lasker. It seems highly probable that mass market advertising will always exist in one form or another, but it is also undeniable that personalizing advertising has enormous advantages that will be fully exploited in the decades to come. It is enormously valuable to know who one is speaking to in an advertisement. One cannot know that when presenting a print ad in a newspaper or broadcasting an advertisement on traditional television. One can know exactly who the target is when advertising online and on smart televisions connected to the internet. Are traditional advertising agencies obsolete today? To what extent are companies like Google and Facebook “disruptors” to traditional advertising? The need to communicate information to potential consumers has not gone away by any means. Indeed, the competitive landscape is just as challenging today as it has ever been, if not more so. So the need to formulate compelling messages to entice consumers to purchase products has not gone away, and it seems very unlikely that this need will ever go away. The internet in general and personalized advertising in particular are important changes to the industry that have the potential to make advertising much more targeted and effective. However, the creative skills that were brought to bear during the early days of advertising are still relevant today, and probably more so because good personalized advertising is more difficult to accomplish effectively, not easier. When radio was first appearing as a new platform for advertising, Albert Lasker was initially skeptical but eventually came to embrace it once it had been proven to be effective. Radio and television were massive changes for the advertising industry but what remained constant is the fact that most messages were intended for the mass market. What is different about the internet is the potential for more targeting but ultimately the internet is simply another platform. The core competency of major platforms like Google and Facebook does not appear to involve the creative side of advertising. Coming up with effective messages will always be in demand and the major players in the industry have embraced this reality organically and through acquisition of specialized digital marketing firms. The advertising industry has consolidated rapidly over the past few decades and is now dominated by a small number of large players such as WPP, Omnicom, Publicis, and Interpublic. These large firms are essentially holding companies for smaller individual agencies that have been acquired over many years. Client turnover in the industry is relatively low and most companies do not change advertising agencies frequently. Advertising firms with longstanding client relationships do not typically require tangible equity to operate, have negative working capital requirements, and throw off significant free cash flow. However, market participants have lately expressed skepticism regarding the long term durability of these business models. While it remains to be seen whether these fears are realized, value investors might do well to examine the advertising industry carefully. Individuals associated with The Rational Walk LLC own shares of Omnicom. I have received a number of inquiries recently regarding The Rational Walk’s presence on “social media”, especially Twitter. Not participating on social media in recent months has been a conscious decision made after much consideration of the amount of “noise” on social media. The “noise” vastly overwhelms any “signal”, and this was just as true for The Rational Walk’s Twitter content as for most other accounts. The value of posting or reading social media is very limited. Even worse, by looking at social media multiple times per day, one engages in “context switching” that is toxic to concentration and development of deeper fluency in any subject. For readers who are on social media, links to any future articles will appear on Twitter, Facebook, and LinkedIn but any other activity will be very rare.